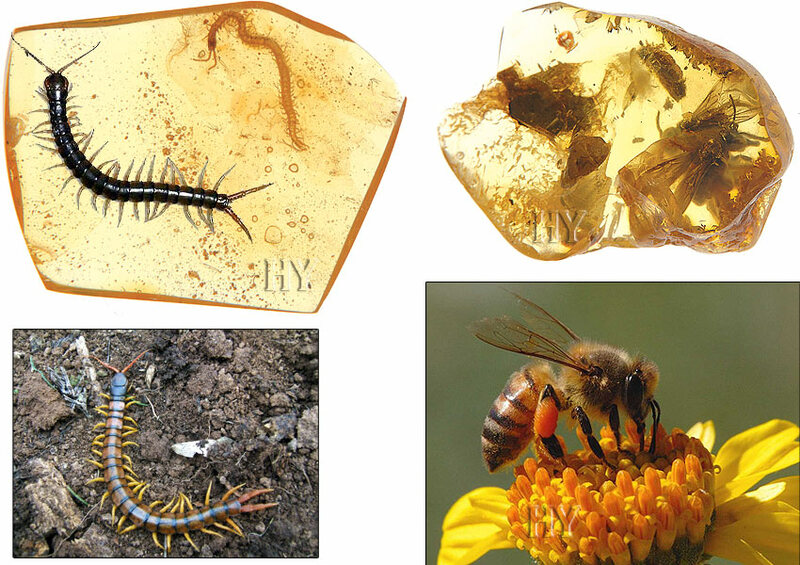 One environment in which fossils are preserved is amber. 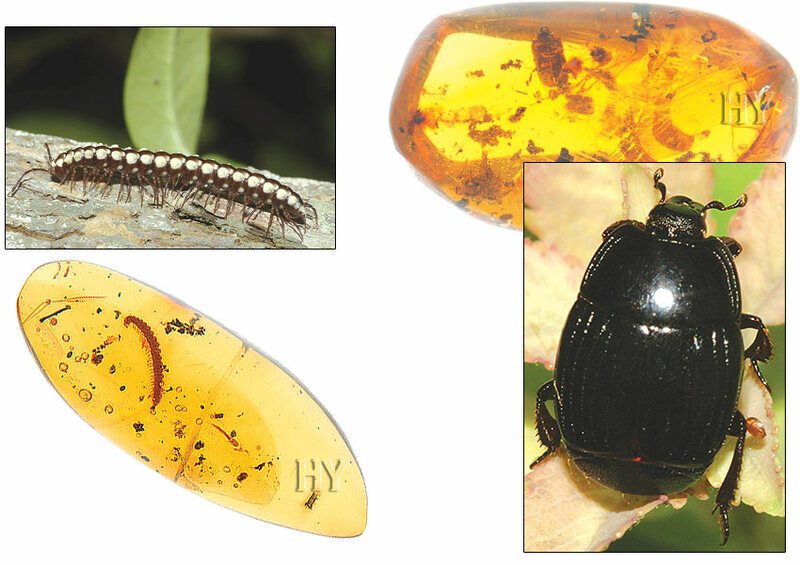 Resin emerging from trees flow over a living thing, preserving it in its exact original state, and such fossils trapped in amber point to a very important fact, as do all other fossils: Living things have remained unchanged for millions of years—in other words, they never underwent evolution. The fossil centipede pictured is 50 million years old. According to evolutionist claims, various alterations should have taken place in these arthropods over the intervening millions of years, during which they should have evolved into another species or life form. However, there is no difference between centipede specimens that lived 50 million years ago and their present-day equivalents. These invertebrates have remained the same for millions of years and are clear evidence of Creation. Cockroaches, which are encountered in the fossil record from the Carboniferous period (354 to 290 million years ago) onwards, are one of the important fossil species proving that living things never evolved. These insects, which have remained unchanged for hundreds of millions of years, reveal a truth that makes the denial of Creation impossible. The humpback fly pictured is around 45 million years old. There are some 3,000 species of these insects, part of the Phoridae family. The insects have kept the same structures for millions of years. If a living thing has undergone absolutely no change for 45 million years, then any claim that it is evolving is out of the question. 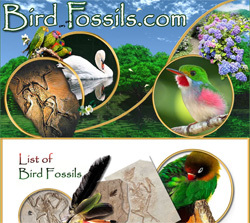 Fossils are the most important indication that evolutionists are lying. Gall midges give rise to the "galls" in plants, a swelling that emerges with more rapid growth in particular locations such as the plant's leaf or stem, due to the saliva secreted by larvae of the organism in question. The larvae then feed on the excess plant tissue that forms inside the gall. Each insect species produces its own characteristic kind of gall. These particular midges, which are generally very small, appear with all their same structures in all fossils yet discovered. In other words, this organism never underwent evolution. Another insect whose immutable structures show that it never evolved is the bog beetle. 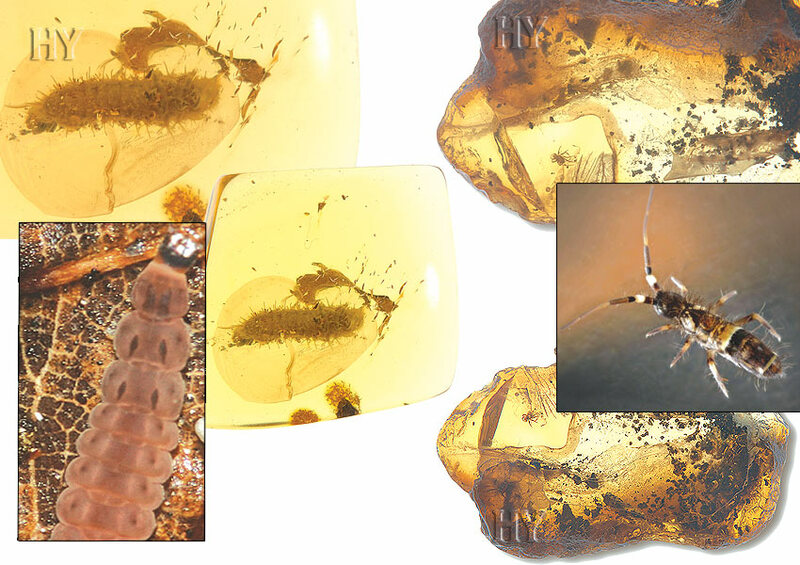 The fossilized amber pictured contains a gall midge trapped alongside a bog beetle. This is a double-sided, "mirror-image" fossil seen on the two halves of a rock. Weevils, part of the Curculionidae superfamily, represent more than 60 separate species. When the fossil record is examined, it appears that these bugs have always existed as weevils, did not evolve from any other life form, have remained unchanged for tens of millions of years and never developed into any other species. 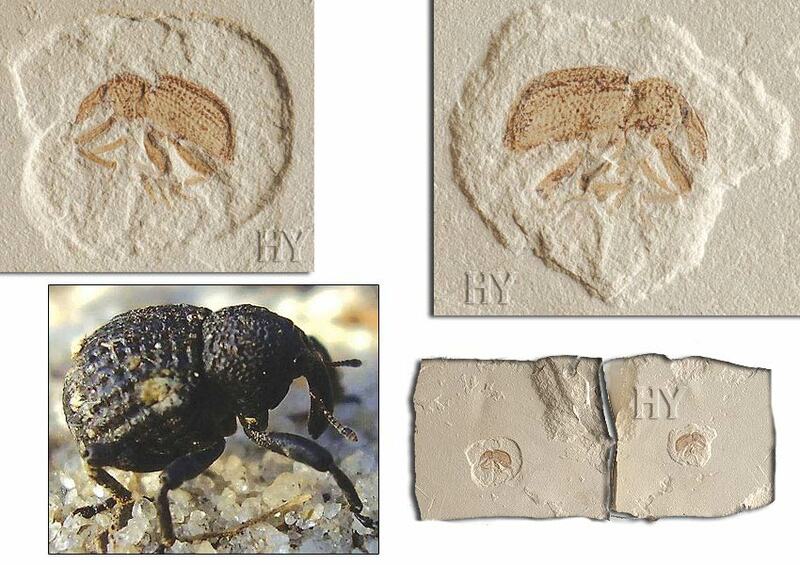 One of the proofs is the weevil fossil pictured here. It is between 54 and 37 million years old, and identical to specimens living today. Here can be seen another double-sided, "mirror image" fossil. With its structure and appearance, which have not altered for tens of millions of years, the marchfly is one of the countless life forms that challenge the theory of evolution. These insects, which average 3 to 12 millimeters (0.1 to 0.4 in) in length, emerge in the springtime, live close to the surface of the soil, and damage plants. The organisms belonging to this family are some of the oldest known flies. Centipedes are exceedingly complex invertebrates whose bodies consist of between 20 and 100 segments, each of which bears a pair of feet. Thanks to this equipment, the creature is able to use its minimum of 40 feet it possesses in a perfect rippling motion. The fossilized centipede pictured dates back around 25 million years, and came into existence with exactly the same complex system as its descendants today, which have survived by using the perfect equipment in their body. It is Almighty God Who creates these centipedes now, Who created them 25 million years ago, and Who endows them with all their flawless structures, such as their immaculate locomotion system. General characteristics of the members of Histeridae family include the truncated structure of their wings and their jointed antennae. The well-preserved insect inside this amber specimen had the same flawless, complete structure as specimens living today. Evolutionists seek to convince people that all living things progress from the primitive to the more highly developed, by way of slow changes. 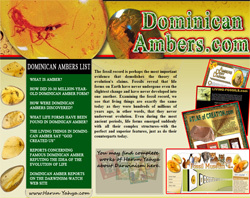 Yet amber specimens millions of years old present clear evidence to show that no such changes ever took place. The fossil centipede pictured belongs to part of the Geophilidae family. This species' body structure resembles a worm or ribbon, and its antennae and legs are short. The fact that centipedes that lived 45 million years ago are exactly as members of the same family alive today is evidence that Darwinism is a terrible deception. The fact revealed by the evidence of fossil findings is that no evolutionary process ever took place; and living things are created by Almighty God. This bee preserved in amber is identical to present-day honeybees. These, with the same mechanisms they have possessed for millions of years, continue living in the same social structure. No "survival of the fittest" of the kind claimed by evolutionists is ever to be seen in beehives. On the contrary, bees behave with the highest levels of altruism and co-operation, in a beehive hierarchy consisting of the queen, workers and males (or drones). Imagine that the same number of humans as the number of bees in a colony had to live together in close quarters, meeting all their own needs by themselves. No doubt, it would be really laborious for humans to establish the order established by bees. Yet from the moment it hatches out of its cell, a bee knows how that order is to be maintained, its duties within that order, and where, when and how to behave. Moreover, no other bee manages these insects or tells them what they need to do. They receive no training, but perform their duties in an exceedingly disciplined manner. That is because bees are created together with these characteristics, and possess exactly the same features as bees that lived millions of years ago. Wasps belonging to this family have characteristically small bodies and flattened heads. Like all other wasp species, members of the Bethylidae family invariably appear with the same features and structures in the fossil record. 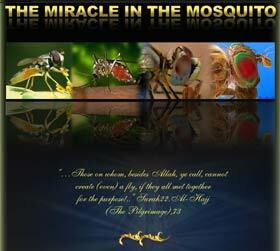 The meaning is evident: These wasps that have remained unchanged over the course of tens of millions of years never underwent evolution, but were created by Almighty God. In order to find a home to live in, soldier beetle larvae employ a highly interesting technique. The larvae cling together en masse on a piece of vegetation or branch in colonies consisting of an average of 460 individuals. However, this is no ordinary mass: From close up, it bears a strong resemblance to a queen bee. When drone bees land on the mass, the larvae attach themselves to the male's abdomen. This enables the larvae to benefit from the new nest that the queen bee—which the drone will seek out—will establish. Observations have revealed that the larvae imitate not only the appearance of queen bees but also their scent! (http://www.biltek.tubitak.gov.tr/haberler/biyoloji/2000-06-9.pdf) These highly intelligent tactics manifest evidence that these insects are not the product of chance, but have been brought into being through a sublime Creation. 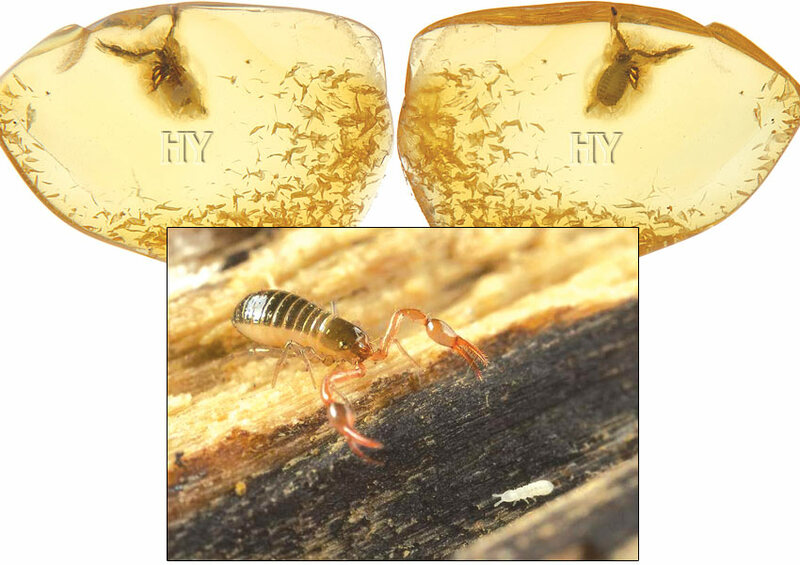 The springtail fossil pictured was obtained from the Baltic amber beds in Poland. Springtails are part of the order Collembola. Organisms belonging to this order are generally smaller than 6 millimeters (0.2 in) in size, and have 6 or fewer feet attached to their thorax. They also have additional spring-like organs attached to their abdomens that enable them to leap out of harm's way in the event of any attack by predators. All of these characteristics possessed by these insects alive today, were also possessed by specimens alive 50 million years ago. This proves that evolution, which maintains that living things are in a process of constant change and gradually develop into other distinct species, does not reflect the true state of affairs. The fossil record reveals no changes or intermediate stages, but rather demonstrates that living things have kept the same flawless characteristics ever since the moment they came into being; and that these species never change so long as they remain in existence. The meaning of this is obvious: Living things never evolved, but were created. 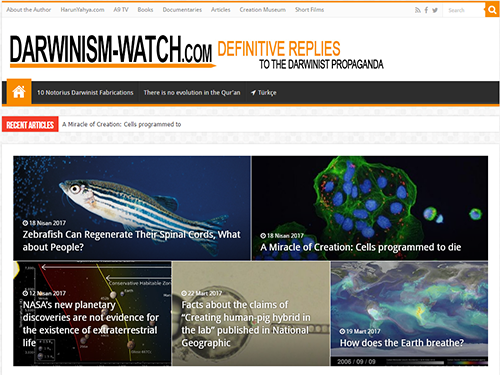 Darwinism is helpless in the face of the important discoveries of the fossil record. To date, some 100 million fossils have been unearthed, and all belong either to extinct life forms or to species that are still alive today. Since no such thing as evolution ever took place, no intermediate fossils exist in the Earth's fossil strata. Living things survive with the same characteristics they have always possessed, never undergoing any alteration. 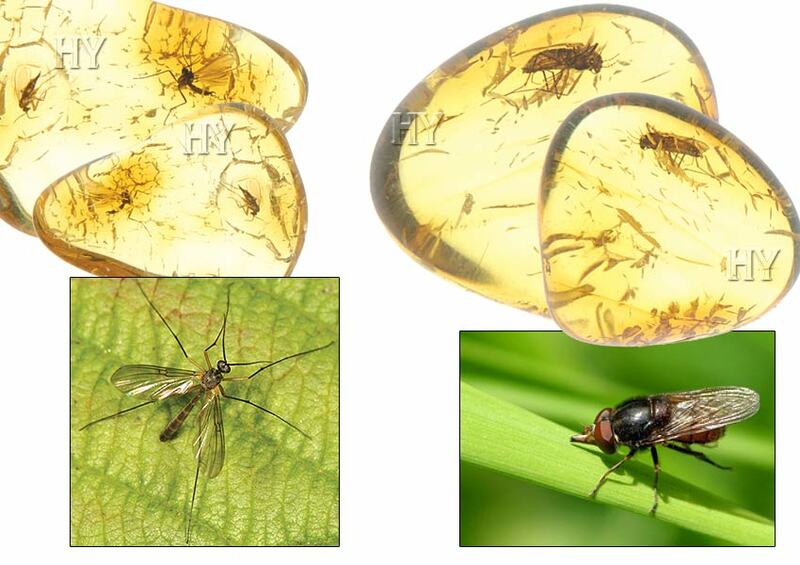 One of the proofs is this fossil amber showing that queen flying ants and long-legged flies have always been exactly the same for 45 million years. Scorpionflies, members of the order Mecoptera, are so called because of their abdominal organs that resemble scorpions' stingers. The females do not possess such sting-like organs. The 125-million-year-old fossil scorpionfly pictured documents that the insects have stayed exactly the same for millions of years and never underwent any evolutionary process. In the face of this fact, documented by countless fossil specimens, Darwinism has been condemned to collapse. Cockroaches live anywhere on Earth, with the exception of the polar regions, and can be traced for millions of years in the fossil record with their flawless and fully developed structures. The specimen pictured is 125 million years old. Cockroaches, having preserved their structures since before 125 million years ago, announce that they never underwent evolution, but were created. Darwinists too will be able to see this evident truth once they rid themselves of their ideological preconceptions. Contrary to what evolutionists claim, these insects, various species of which are encountered as fossils from the Carboniferous period (354 to 292 million years ago), have no evolutionary forerunners. Each species appears suddenly in the fossil record with its own unique structure and characteristics, and remains unchanged for so long as it remains in existence. This fact makes it impossible for Darwinists to defend their scenario of evolution. These arachnids, belonging to the arthropod phylum, have been given this name because their structure is reminiscent of scorpions. However, their anatomical characteristics are much closer to those of spiders than of scorpions. The oldest known specimens lived in the Devonian period (417 to 354 million years ago). And these invertebrates have never changed since the moment they first appeared in the fossil record. The fact that they remained unchanged for hundreds of millions of years is proof that they never evolved. One of the most distinctive features of the fossil record is how species remain unchanged during the geological periods in which they appear. A species preserves the structure it has when it first appears as a fossil until it either becomes extinct or else comes down unchanged to the present, over the course of tens or even hundreds of millions of years. This is clear evidence that living things never evolved. 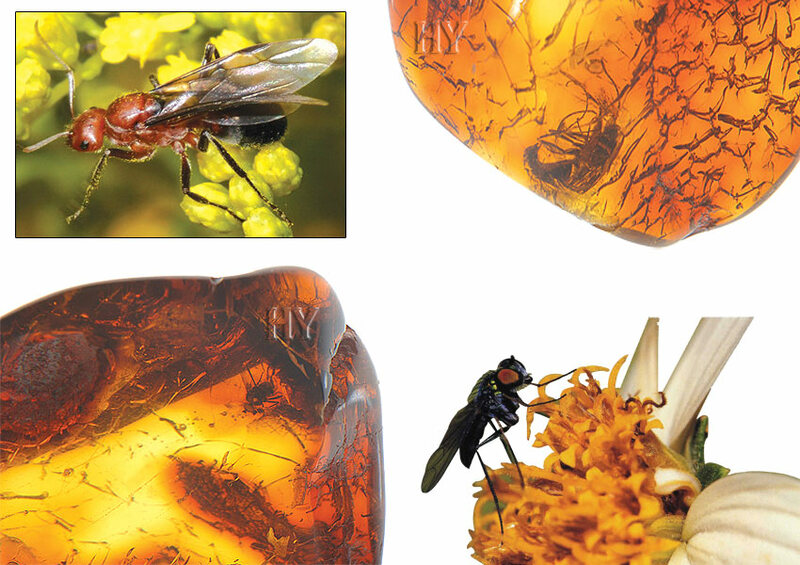 There is no difference between this 50-million-year-old fly fossilized in amber shown here and flies living today. The aphid is a species of insect that feeds on plants and is a member of the superfamily Aphidoidea. There are some 4,000 known species of aphids, divided into 10 families. 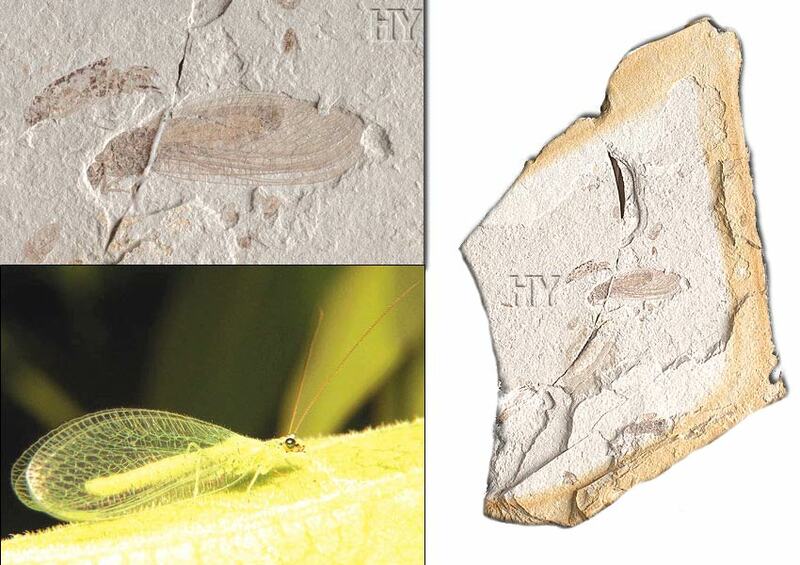 The oldest aphids so far identified lived in the Carboniferous period (354 to 290 million years ago). They have not changed in the least in the more than 300 million years since. 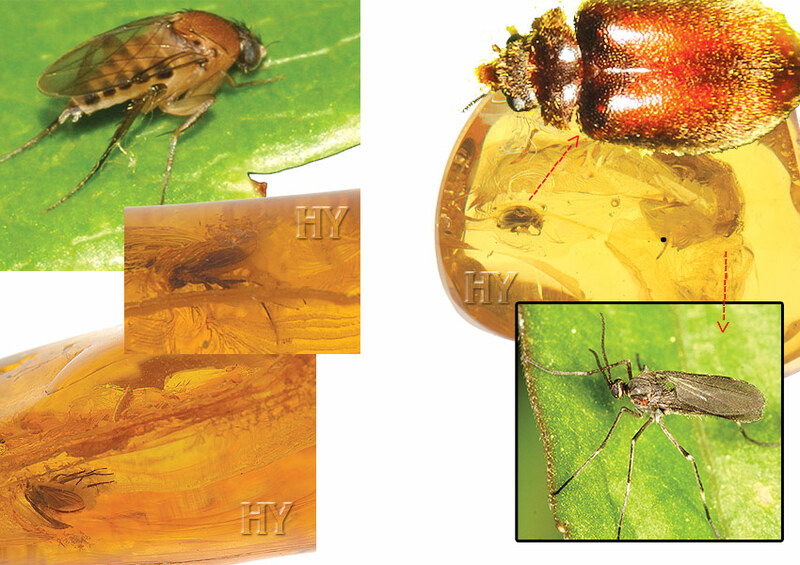 The 50-million-year-old aphid preserved in amber in the picture is evidence that these insects have not changed since the day they first came into being, in other words, they have not evolved. As fossils show, all insect species alive today have displayed their same current flawless structures since the first moment they came into being. They never developed in stages and never changed. 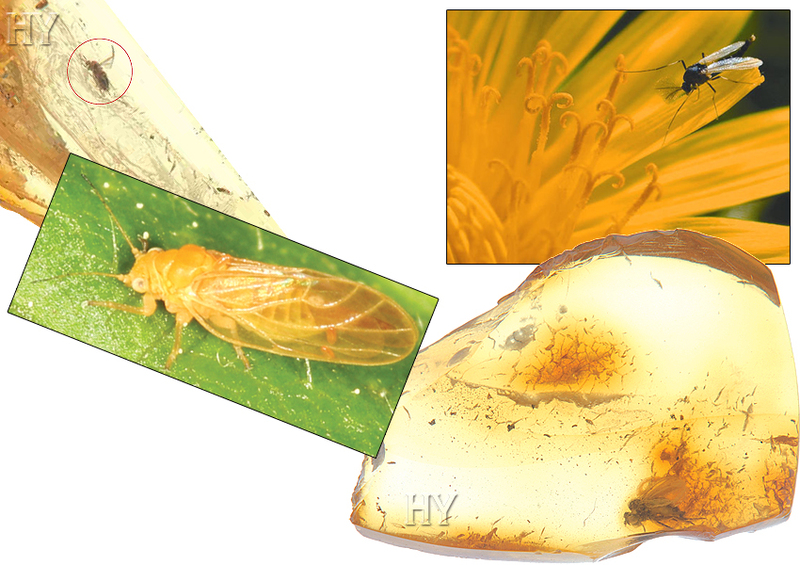 One of the proofs is this 50-million-year-old homopteran preserved in amber. Like all other living things, flies appear suddenly in the fossil record, complete with all their own particular structures. They survive today with no changes in their sophisticated anatomy. 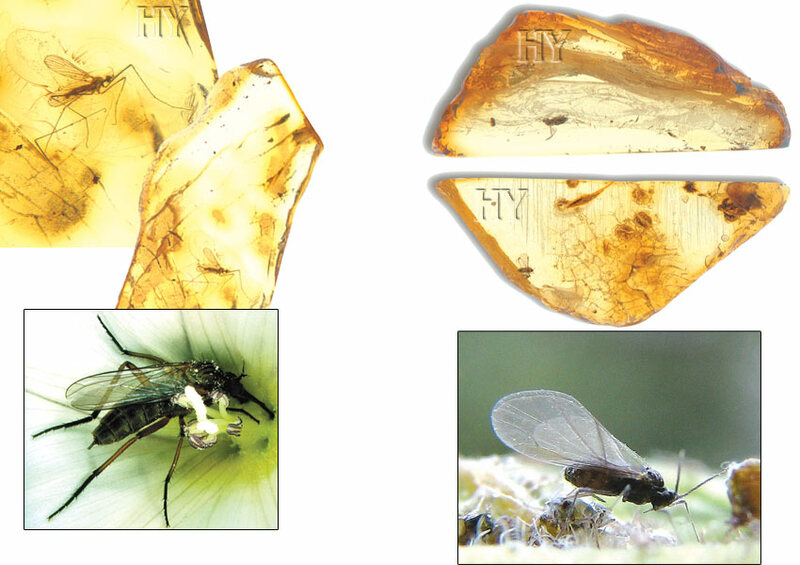 This fossil, preserved in 50-million-year-old amber, shows that there is no difference between flies living that long ago and present-day specimens. This once again reveals that evolution never happened, and proves the manifest fact of Creation. The oldest known spiders date back 400 million years. Some 40,000 species of spiders have been described, divided into 111 families. It is estimated that there are another 200,000 species not yet been identified and classified. Every one of these spider species emerges suddenly in the fossil record, with all its unique structures fully formed. Not a single fossil exists to indicate that spiders developed from a primitive to a more advanced stage, as evolutionists claim. There are, however, countless fossils showing that spiders have always existed as spiders. 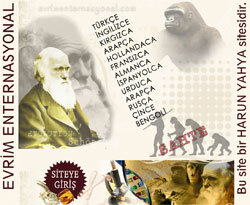 Each of these fossils once again confirms the fact of Creation. Countless fossils belonging to different species of spider show that these arachnids have existed in perfect form with all the characteristics they now possess ever since they first came into being. Not one is semi-developed. None has turned into any other life form. To put it another way, spiders have always existed as spiders, and will always continue to exist as such. 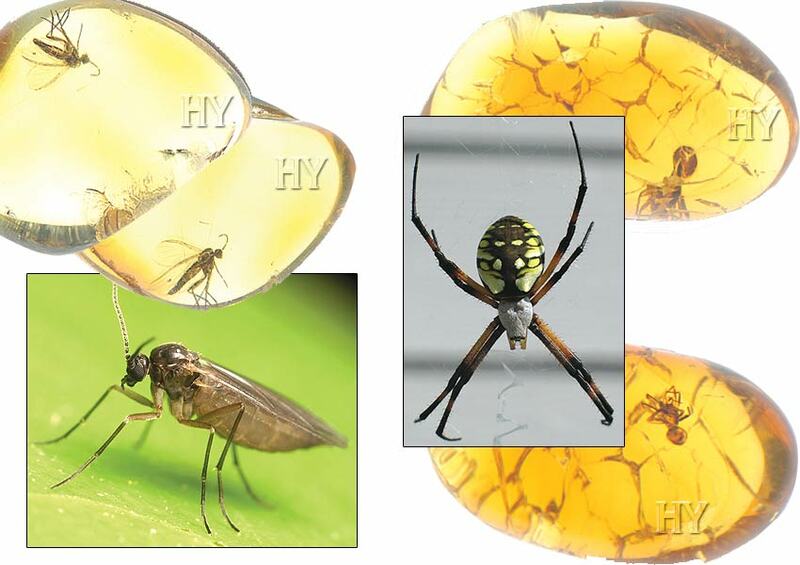 This spider preserved in amber is 50 million years old and shows that, like other living things, spiders never evolved. These flies, belonging to the order Diptera, resemble very large mosquitoes. Their distinguishing features are the length of their legs and bodies. Some 14,000 species have been described to date, representing one of the most numerous families in the order Diptera. The countless fly fossils discovered to date show that these insects have always existed as flies, they are not descended from any other life form, and never underwent any intermediate stages. 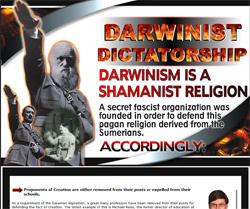 In other words, they demolish evolutionist claims, showing us that they are the work of Omniscient and Almighty God. The 50-million-year-old spider fossil pictured is one piece of evidence showing that spiders never evolved, but have always existed as spiders. There is no difference between spiders that lived 50 million years ago and spiders living today. This once again reveals that the theory of evolution is a figment of the imagination, and that God has created all living things. Soft-bodied arthropods (Miridae) are a family that wreaks the greatest harm on crops and comprises a very large number of species—approximately 6,000. They tear plant tissues and feed on the sap. 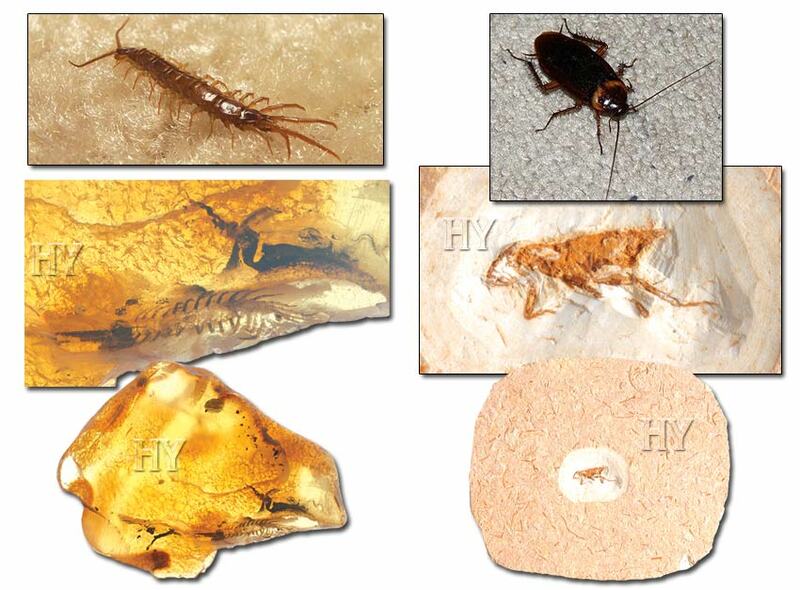 The fossils acquired to date show that soft-bodied arthropods have always existed with the exact same characteristics. In other words, like all living things, these insects never underwent any form of evolutionary process. The 50-million-year-old fossil pictured is just one of the indications of this. 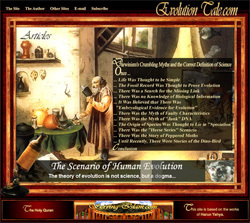 The fossil record completely refutes the scenario advanced by evolutionists. Yet even those evolutionists who have not lost the ability to evaluate scientific findings in an unbiased manner admit that the fossil record argues against the theory of evolution, because that fact is crystal-clear. 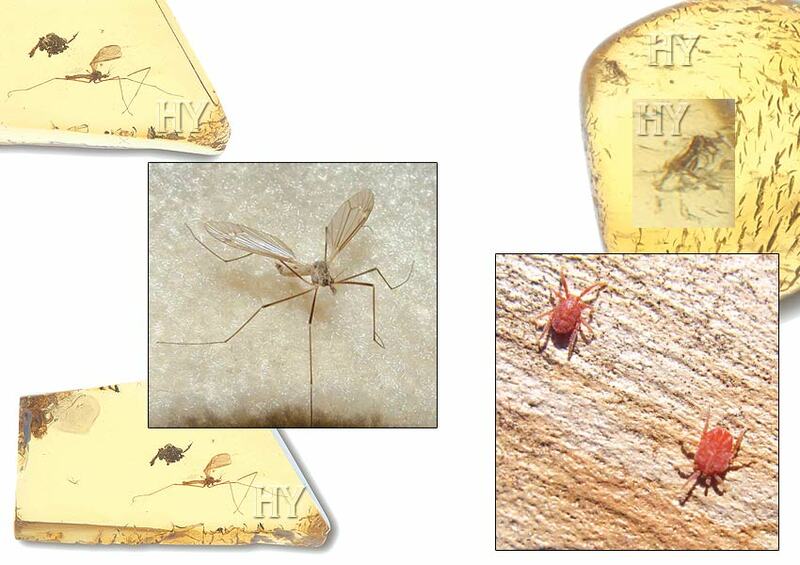 One of these proofs is the 50-million-year-old aphid fossil pictured. 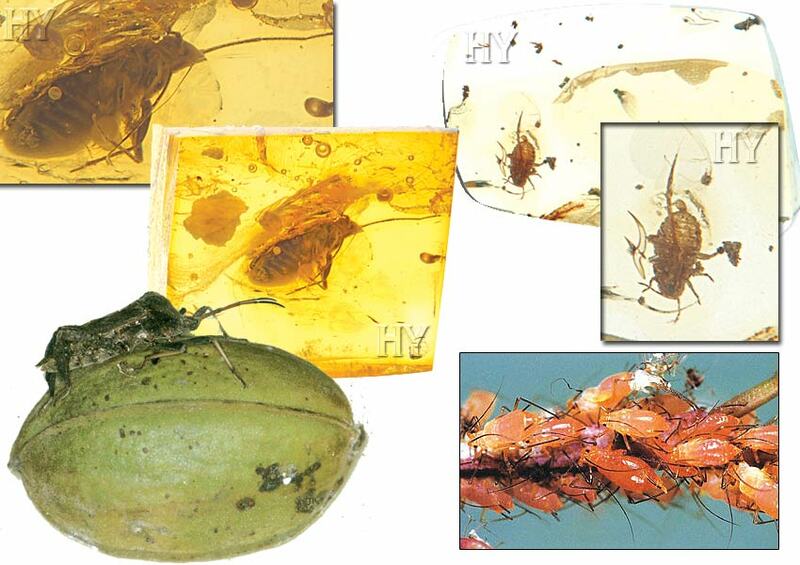 There is no difference between aphids living 50 million years ago and those alive today. This totally demolishes the claim that living things attained their present forms by a process of gradual changes. The hundreds of thousands of fossil specimens obtained to date all show that living things never evolved different anatomical structures, but have remained the same for hundreds of millions of years. Living species that stay the same for that long deal a severe blow to Darwinism, which maintains that living things are descended from one another and developed by way of gradual changes. One of the life forms that dealt such a grave blow to Darwinism is the fungus gnat. The fossil pictured here is 45 million years old. These unchanged insects are some of the proofs of the fact of Creation. Like all other living things, fungus gnats have remained unaltered for millions of years, with the same wings, vision systems and leg structures. Were evolutionists' claims true, then the fossil record should show the gradual changes that fungus gnats supposedly went through… For example, a great many fossils reminiscent of fungus gnats should have been found whose wings have not yet formed fully or whose eyes are only half-developed, and which have yet to achieve the form they have today. Yet despite around a century of excavations all over the world, not a single fossil specimen that might support evolutionists' claims has ever been encountered. All the specimens obtained are of fungus gnats with the same fully formed features they now display. With their compound eyes and sublime flying abilities, dragonflies are marvels of Creation. 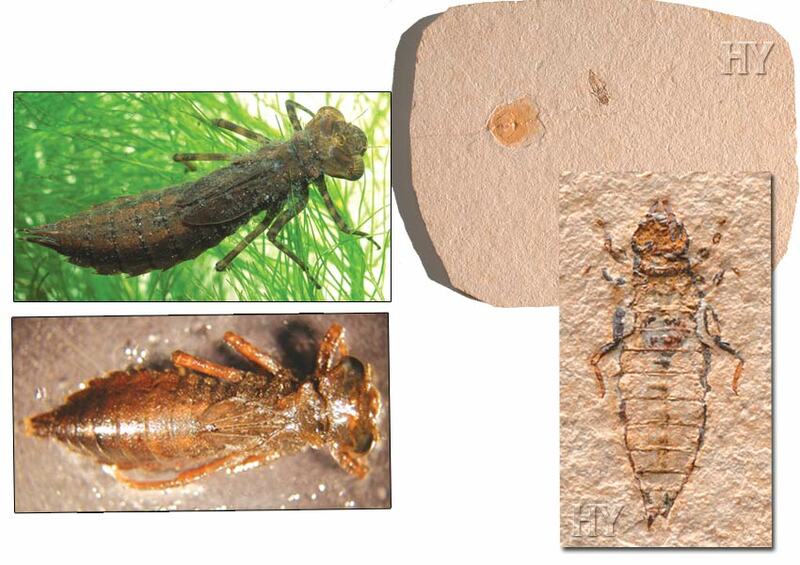 There is no difference between this dragonfly larva from 125 million years ago and a modern-day specimen. This demolishes the idea of the evolution of living things. The hollow, groundless comments and publications of evolutionists that are produced for propaganda only do not change this fact. Fungus gnat larvae live on plant roots, fungi or waste. They are small, dark in color and have short life spans. 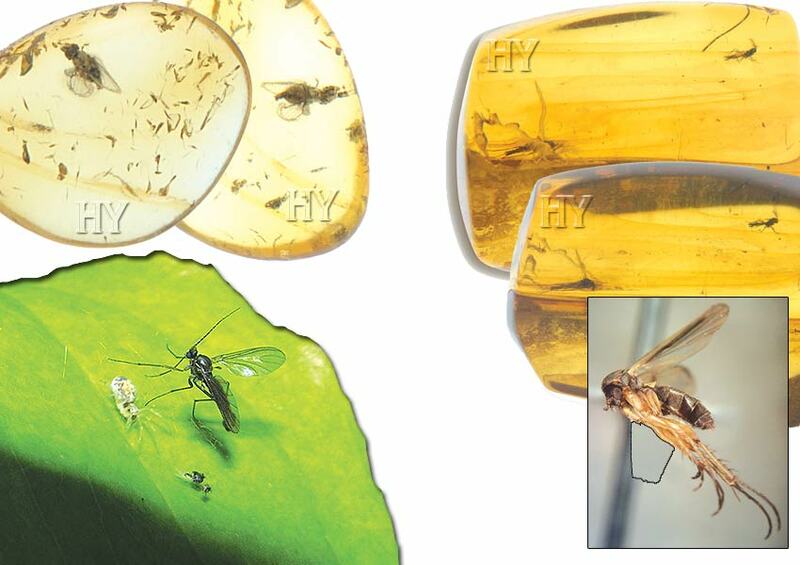 There is no difference between the fungus gnats of 45 million years ago and specimens living today. Fossil discoveries are one proof of this. Fungus gnats that have remained unaltered over the course of millions of years once again confirm that living things did not evolve, and that God has created all life forms. 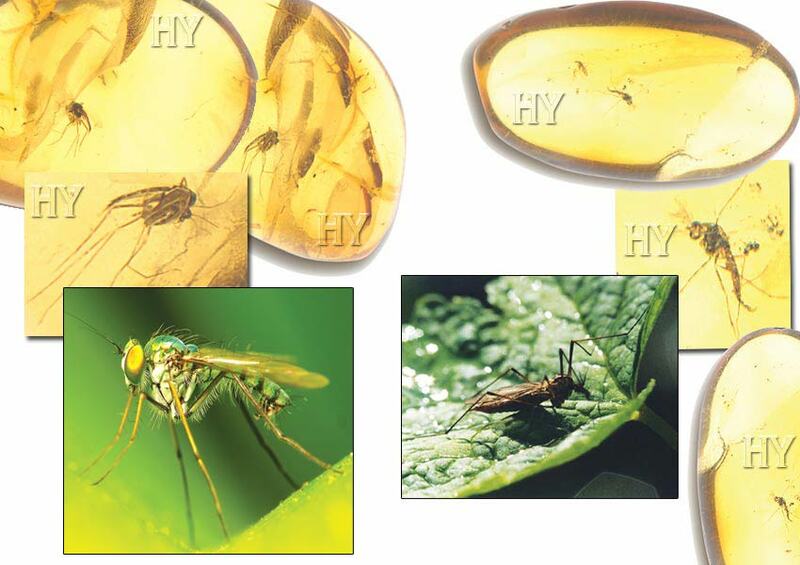 One of the proofs that flies have always existed as flies, are not descended from any other life form and never underwent any intermediate stages are the 45-million-year-old fossils shown here. 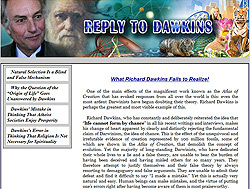 Unaltered despite the intervening millions of years, flies confirm that the theory of evolution is a deception and that God has created all living things. 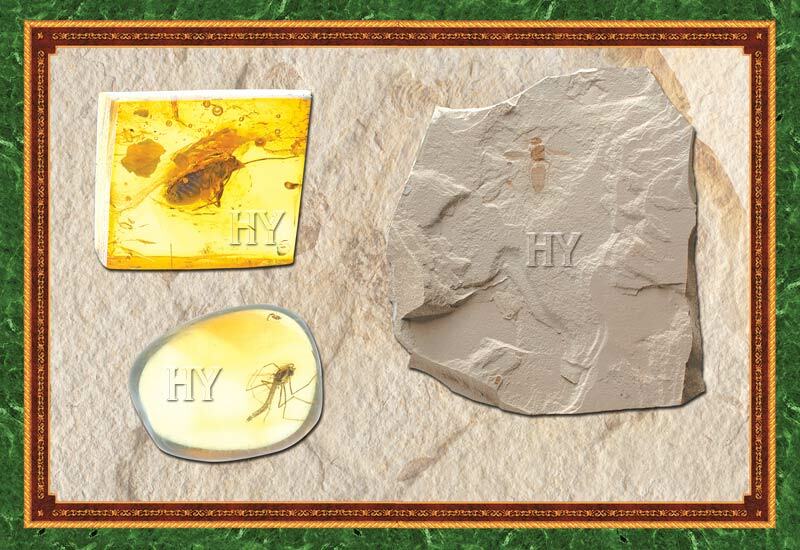 A fly and a spider have been fossilized in amber. This dual fossil, which is 50 million years old, is one of the proofs pointing out the despairing situation of evolutionists. Spiders, mites, centipedes and other such invertebrates are not true insects, although that is how they are commonly referred to. 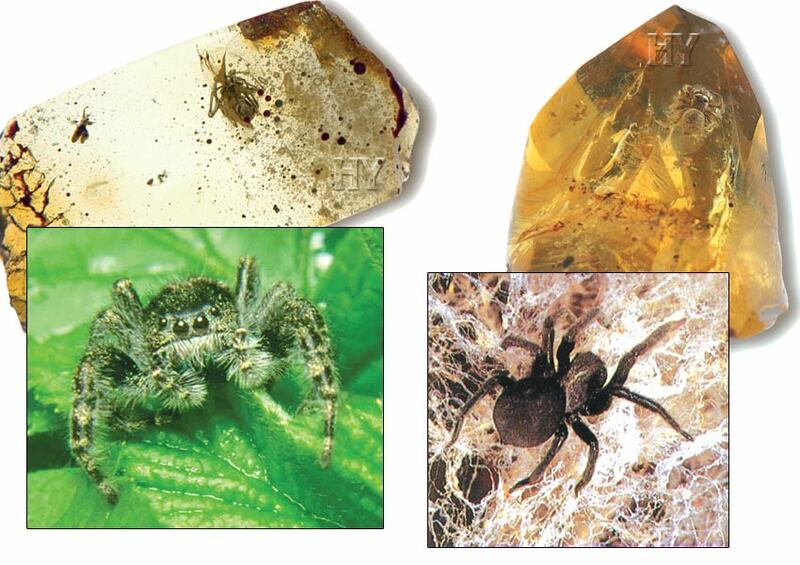 Highly significant fossil findings regarding these creatures were presented at the 1983 annual conference of the American Association for the Advancement of Science: The fascinating features of these 380-million-year-old spider, mite and centipede fossils were no different from those of contemporary specimens. One of the most distinctive features of the fossil record is how living things remain unchanged during the geological periods in which they are discovered. A species preserves the structure it had when it first appears in the fossil record, until it either becomes extinct or else survives unchanged, over the course of tens or even hundreds of millions of years, to the present day. The meaning of this is clear: Living things did not undergo any process of evolution. God creates all living things together with the characteristics they possess. One of the organisms that has survived unaltered for millions of years is the fungus gnat. 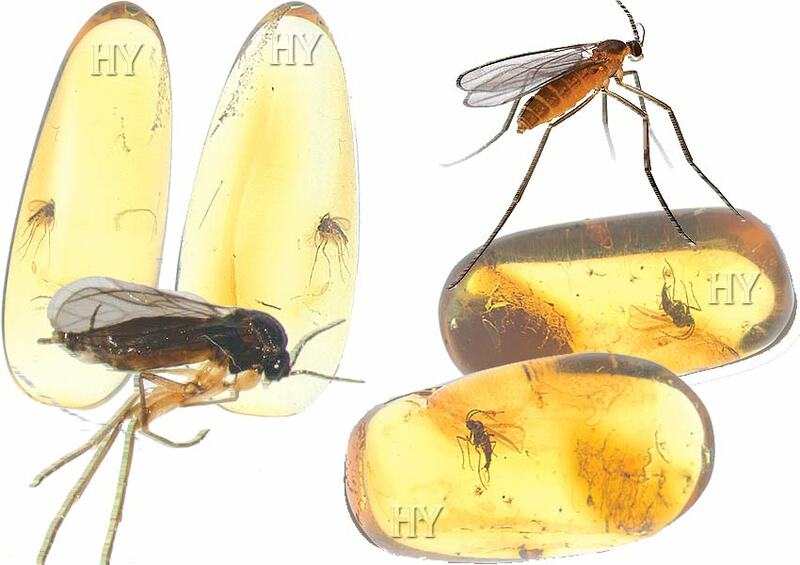 There is no difference between this 45-million-year-old fungus gnat pictured and specimens living today. The 45-million-year-old fungus gnat pictured, with all its features, is fully formed and flawless. A fungus gnat living 45 million years ago is identical to those living today. Not the slightest change has taken place over millions of years in the fungus gnat's wings or flight systems, eyes and visual systems, or legs or any other of its physical structures. 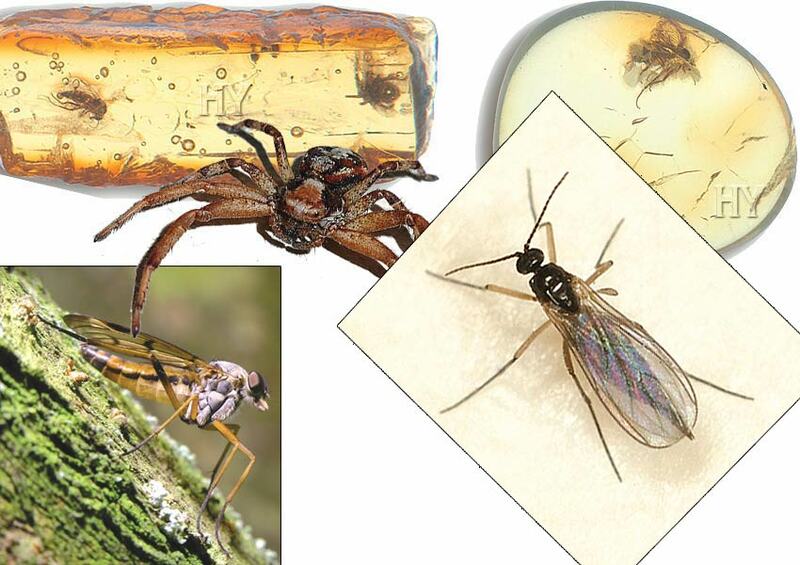 Fungus gnats were exactly the same 45 million years ago as they are today. In the absence of a single fossil specimen showing that species evolve from earlier ones and are in a constant state of change, there are nevertheless countless fossil discoveries to show that living things preserve the exact same structures for as long as they are in existence. The 45-million-year-old fungus gnat pictured is one example. 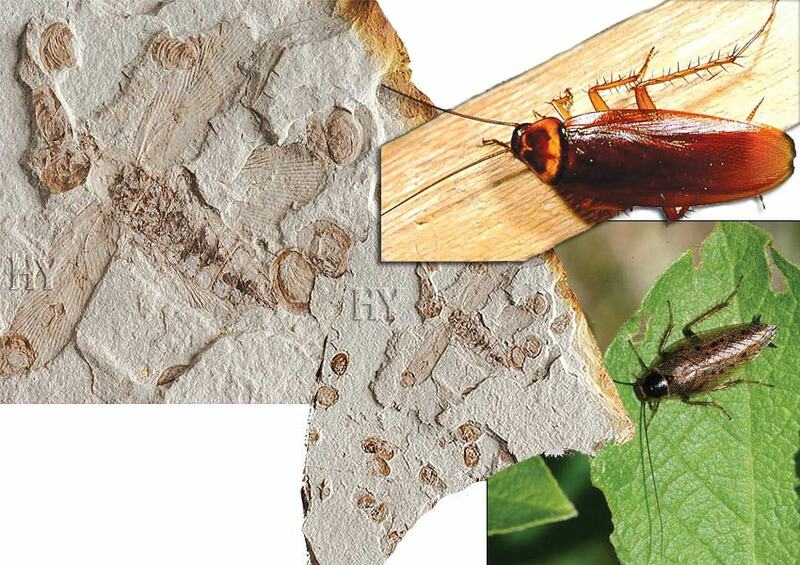 This finding shows that these insects have remained unchanged for millions of years. The stability in the fossil record, by itself, is sufficient to totally undermine the theory of evolution. Midges are a very small species of fly, and another life form that demolishes the theory of evolution. In the same way that spiders have always been spiders, flies have always been flies, and ants have always been ants, so midges have always existed as midges. 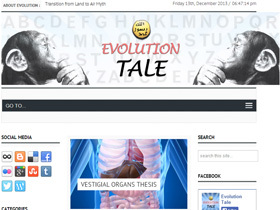 There is not the slightest evidence that they evolved gradually from any other species, as evolutionists claim. On the contrary, all the scientific findings and fossil records show that midges emerged suddenly, together with all their flawless structures. In other words, God created them and they have never changed—meaning that they never evolved. 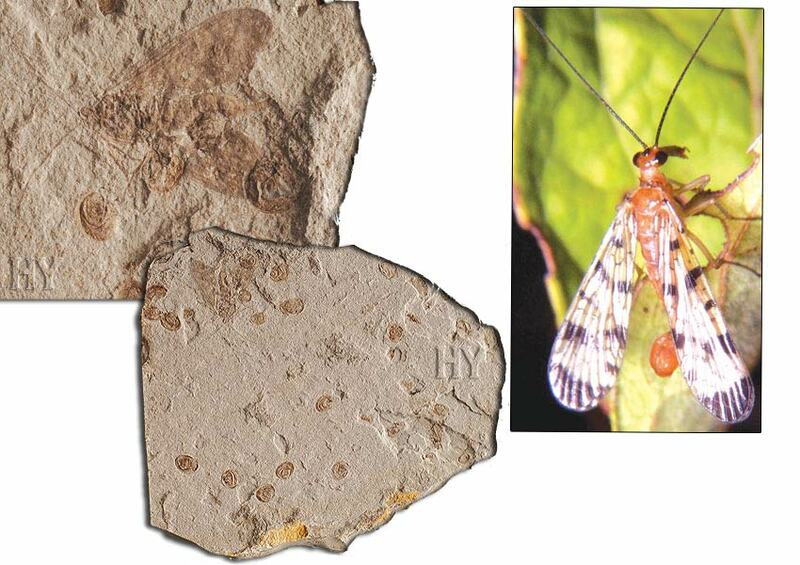 There is not the slightest difference between the 45-million-year-old fungus gnat fossil pictured and specimens alive today. 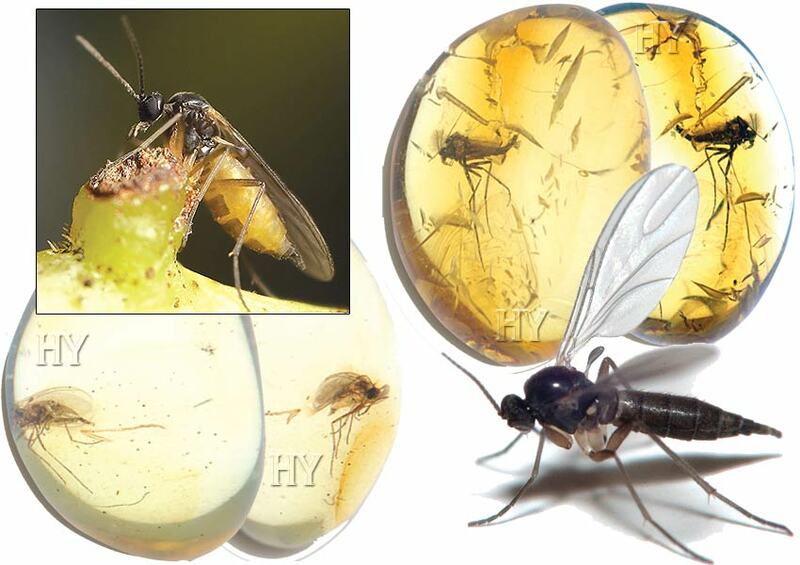 Evolutionists have no logical explanation for fungus gnats, which have remained unchanged for 45 million years. 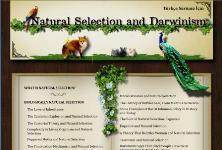 As you have seen, natural history definitively and clearly refutes the theory of evolution. As can be learned from fossils—our source of information regarding the natural history of species that once existed in the past—living things possessed of complete features have always populated the Earth. The feet, forearms, wings, skins, fur, lungs, skulls, vertebrae, bone structures and countless other such characteristics of these creatures have always been fully formed, unique to them and of an ideal structure. No intermediate stage—in other words no "developing" limb or organ—exists in any fossil. This represents a major impasse for evolutionists. 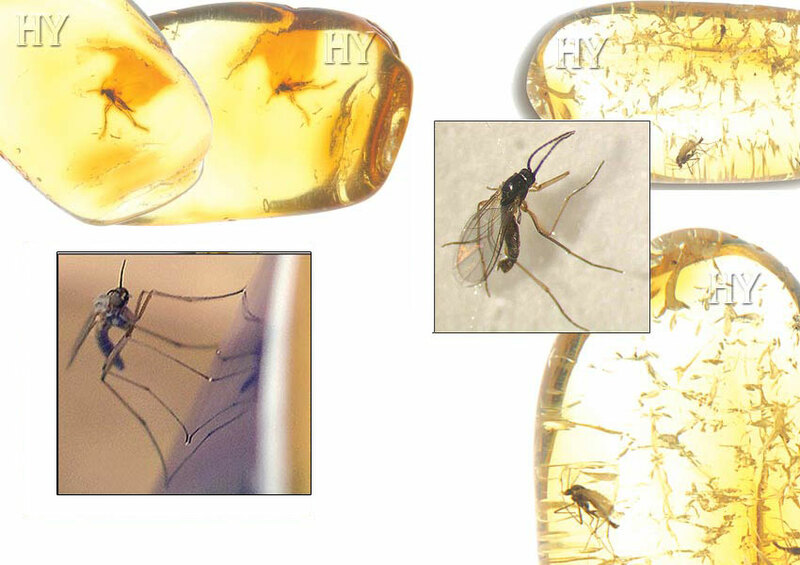 The 45-million-year-old fungus gnat fossil pictured is one proof of these facts. The fossil record shows that living things have remained unchanged for tens or even hundreds of millions of years. This, by itself, is sufficient to demolish the theory of evolution. In addition, the absence of any "intermediate forms" (half-fish, half-reptile, or half-reptile, half-bird species) in the fossil record again gives the lie to the theory. Among all the millions of fossils belonging to thousands of living species obtained so far, there is not a single example of a life form that isn't fully developed, or lacks certain attributes, that has remained halfway between two separate species. Every fossil shows that the living thing preserved is fully formed with all its characteristics, and that today's descendants have never changed since the species first came into existence. The 45-million-year-old fossil pictured is one example, showing that gall gnats have not changed over that period of time. All the fossils of fungus gnats found to date show that these animals have always been fungus gnats, are not descended from any other species, and did not evolve into any other species. 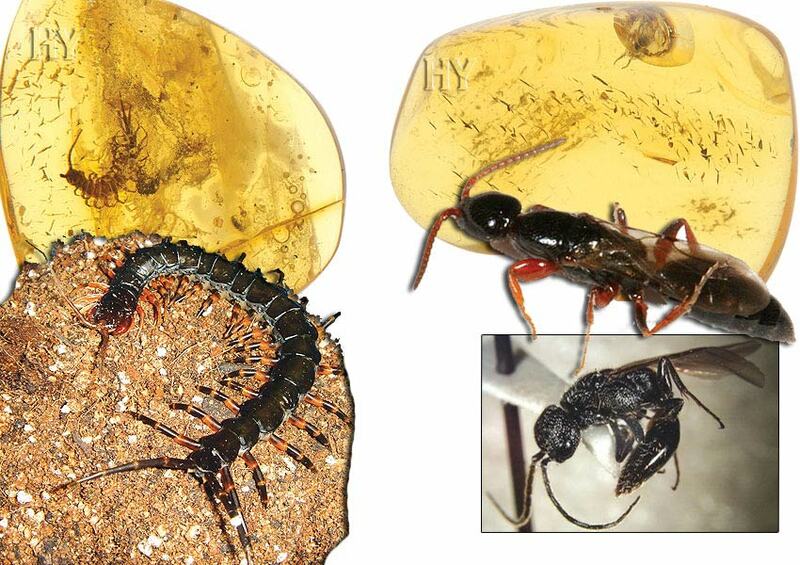 This 45-million-year-old specimen preserved in amber is one confirmation of this. A large number of fossils show that spiders have existed as spiders for hundreds of millions of years. 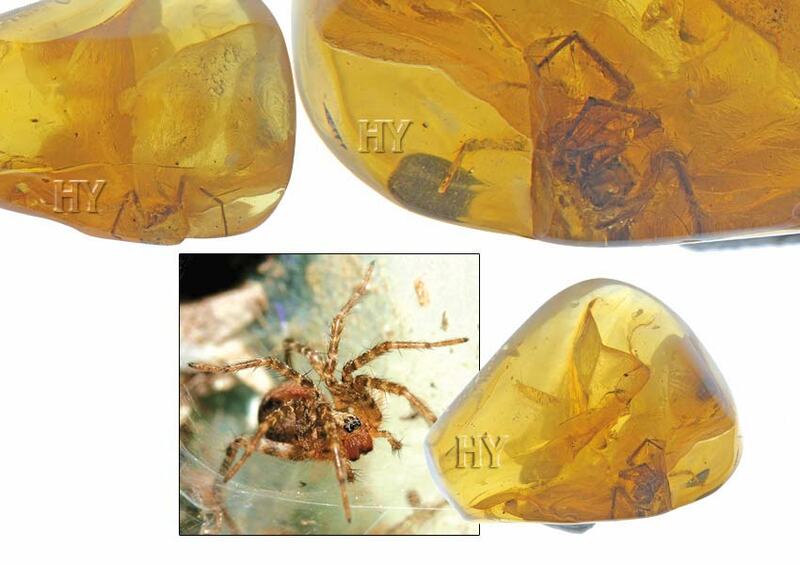 One of these specimens is this 45-million-year-old spider preserved in amber. Spiders living 100 million years ago, those living 50 million years ago and those alive today are all exactly the same. 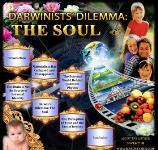 This poses a major dilemma for evolutionists and reveals their theory to be a terrible deception. There are more than 200 genera and around 6,500 known species of long-legged fly. They can be found just about everywhere on Earth, including the Tropics and at high altitudes. 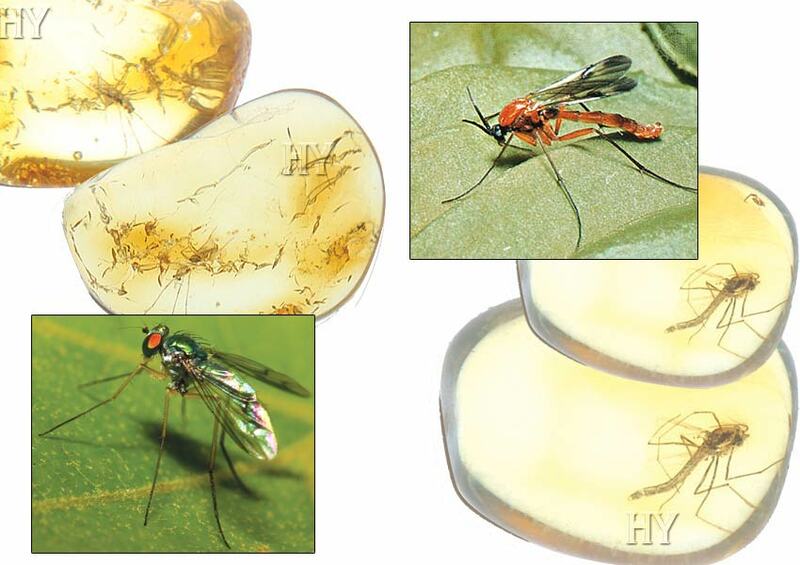 The 45-million-year-old long-legged fly pictured is identical to specimens alive today. These life forms, which have remained unaltered for millions of years, completely overturn the claim that living things descended from one another by undergoing small changes over lengthy periods of time. 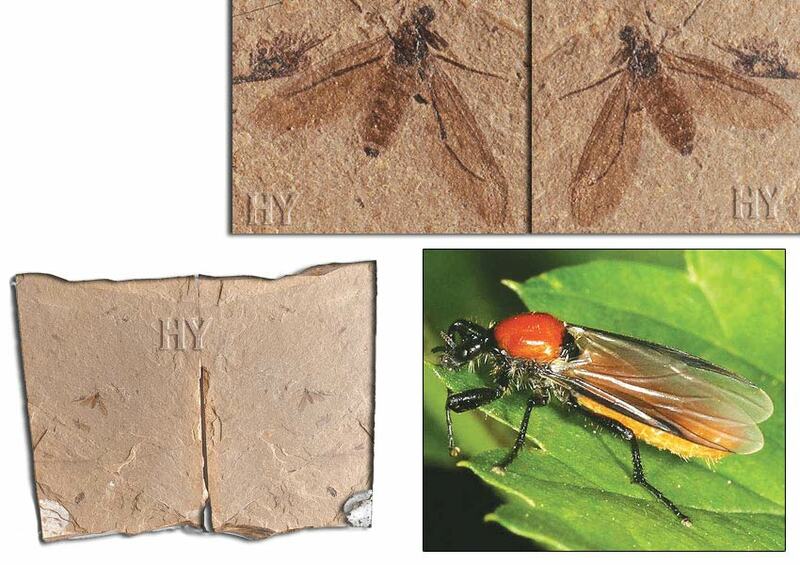 One of the proofs showing that fungus gnats have always existed as fungus gnats is this 45-million-year-old fossil. Fungus gnats of 45 million years ago were identical to those living today, showing that the concept of "evolutionary development" is a grave deception. 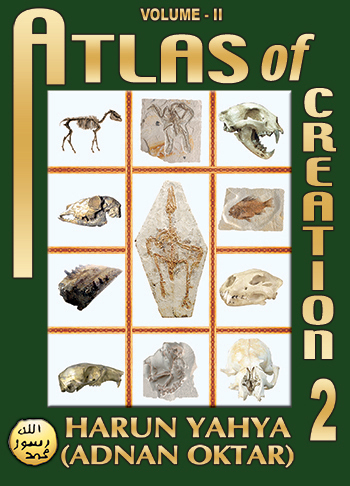 The fossil record reveals that in fact, living things did not evolve, that Almighty God creates all of them. Flies appear suddenly in the fossil record with all their organs and functions fully formed, invalidating evolutionist claims. The fact revealed by the fossil record is that flies did not evolve gradually from some other species. From the moment they first came into being until the present day, they have not changed at all. The 45-million-year-old long-legged fly fossil pictured is one proof that these flies have never changed—in other words, that they never evolved. Ever since the mid-19th century, evolutionists have been looking for intermediate-form fossils to confirm their theory, carrying out wide-ranging excavations all over the world. The supposedly intermediate forms they seek have never been found. All the findings from excavations and the research performed show that contrary to evolutionists' expectations, living things appeared suddenly on Earth, fully and perfectly formed. In other words, God creates all living things. In seeking to prove their theory, evolutionists have actually demolished it with their own efforts. One of the pieces of evidence that disprove the theory of evolution is the 45-million-year-old midge fossil pictured. This fossil shows that midges have undergone no changes over 45 million years, revealing that Creation is an indisputable fact. Even bacteria that lived billions of years ago have been preserved in the fossil record. Despite this, however, it is striking that not a single fossil that might argue in favor of the theory of evolution has ever been found. Fossils belonging to a great many species, from ants to bacteria, from birds to flowering plants, have been unearthed. Extinct life forms have been so perfectly preserved that we are even able to establish the inner anatomy of these life forms we have never seen alive. Despite such a rich fossil record, the absence of any evidence in support of the theory of evolution once again emphasizes that the theory is a terrible deception and that Creation is an inarguable fact. But, as by this theory innumerable transitional forms must have existed, why do we not find them embedded in countless numbers in the crust of the earth? . . . Why then is not every geological formation and every stratum full of such intermediate links? 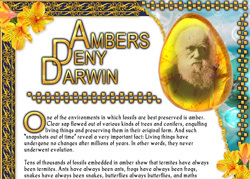 Research conducted in the 150 years since Darwin's time has translated his fear into reality, and all subsequent discoveries have proven that his theory is entirely unrelated to actual natural history. 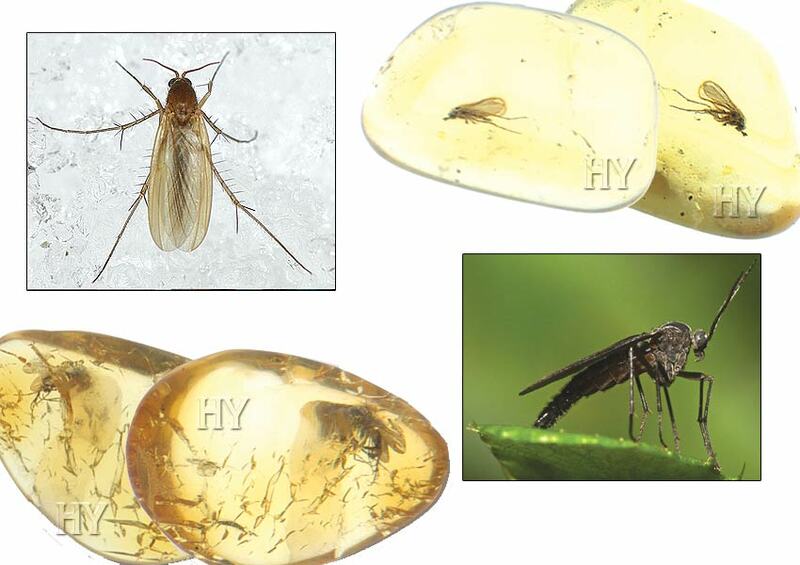 One of these proofs is the fungus gnat pictured, showing that these insects have remained unchanged for millions of years and have never undergone any intermediate stages. The oldest known fossilized spider dates back some 300 million years. 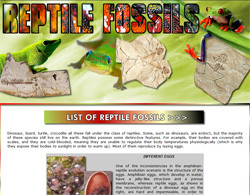 The Museum of Australia's web page, for example, states that 380-million-year-old specimens of the species Attercopus fimbriungus possessed silk-producing organs even at that time. Spiders, which for hundreds of millions of years have undergone no changes in their physical characteristics, silk-producing organs or the silk they produce, inflict complete despair on Darwinists. The fossil record shows that spiders emerged not through evolution, but suddenly and fully formed. In other words, they did not evolve, but were created and remained unchanged for millions of years.